A few days before I set out on this adventure I parked my bicycle next to a bike that I thought for a moment was a ghost bike. Upon closer inspection I discovered remnants of flowers and decorations. The chain was painted white, but the seat was no longer pained nor the handlebar grips. My guess: this was a stolen ghost bike that they had put a different seat and handle bar grips. When I returned, the “ghost bike” was gone, and so was my bicycle seat. 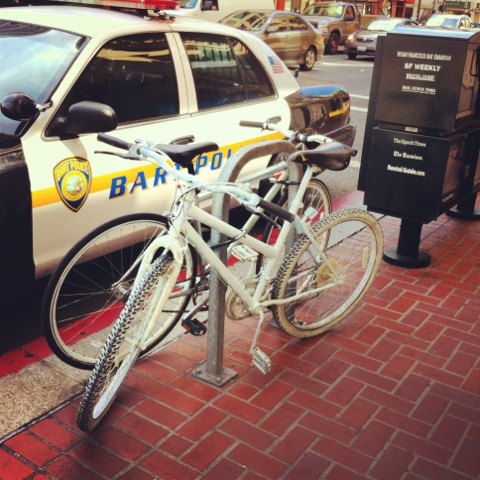 One Response to "Stolen ghost bike and thief – Friday, September 28, 2012"